In addition to the silverware wind chime, there are endless crafting possibilities for using old silverware. 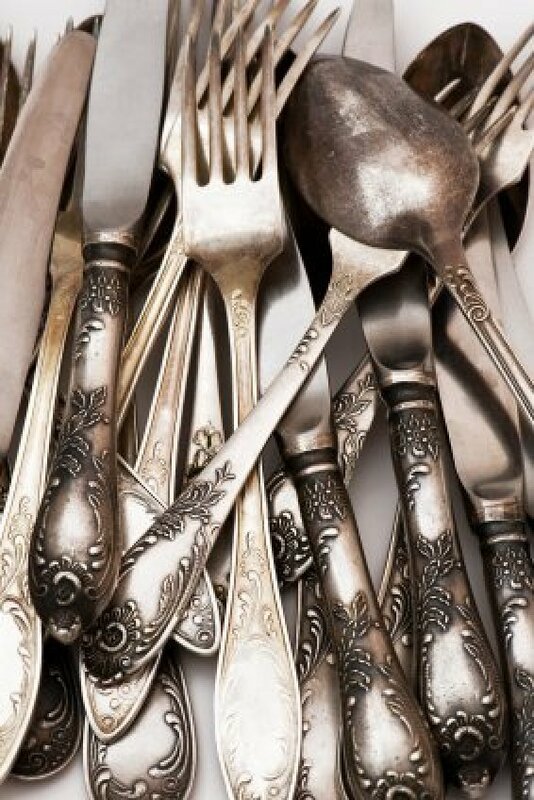 This is a guide about crafts using old silverware. 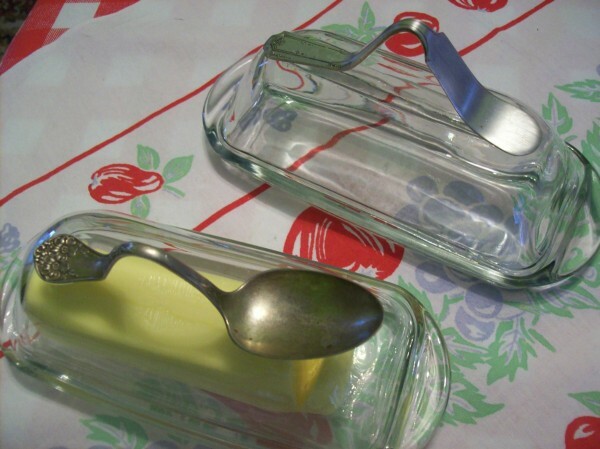 Update a simple glass butter dish by adding a bent piece of silverware. Glue to top using a good adhesive like E-6000. It's probably best to wash by hand. 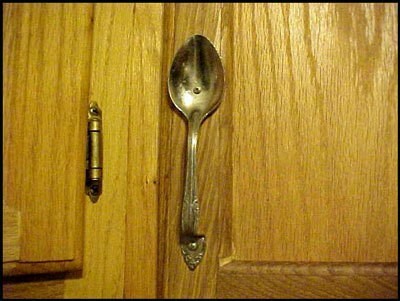 The knobs and handles for kitchen cabinets are so expensive unless you want to settle for plain old wooden knobs. Here is how my husband and I were able to have something a little fancier with lots less money. Take old silver fork which you can pick up a yard sales, etc. 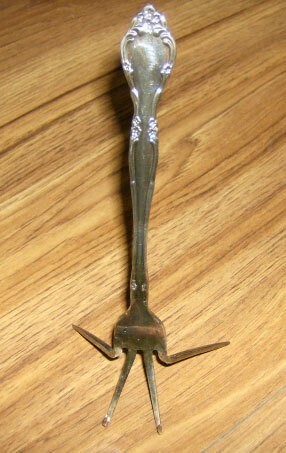 Need four prong one, bend outside prongs at an angle and separate and bend up middle to prongs. You may have to fiddle with it to get exact. Use to hold business cards or place cards at table. I wanted some unusual tie-backs for my curtains. So I had the idea to take two beautiful old silverplated spoons that I owned and I bent them back into a "U" shape. I once tried to drill through silverware and could not do it. Is there a trick to it? I have heard that you need a special type of drill bit. 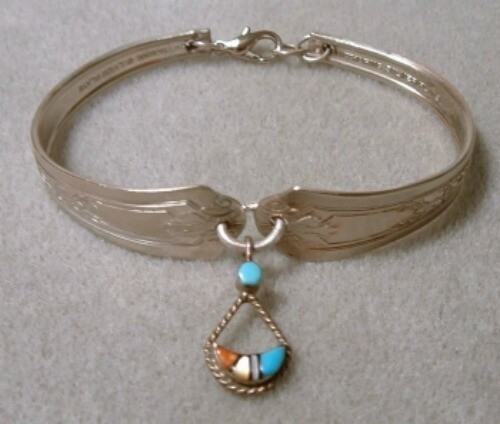 I use a drill press, I have made silverware jewelry and other thing from old silverware for years. I am looking for a craft person who was at the Mount Dora fair this past March. They had a lot of lovely things, but their crosses where just beautiful and I need to reach them. Thank you in advance for any help you can give me. Why not contact the folks that run the fair. The Mount Dora Craft Fair is operated by the Visit Mount Dora, Inc.
How do I make flower design yard art from old flatware ? Silverware can be used for all sorts of creative craft ideas. This is a guide about bending silverware for crafts. 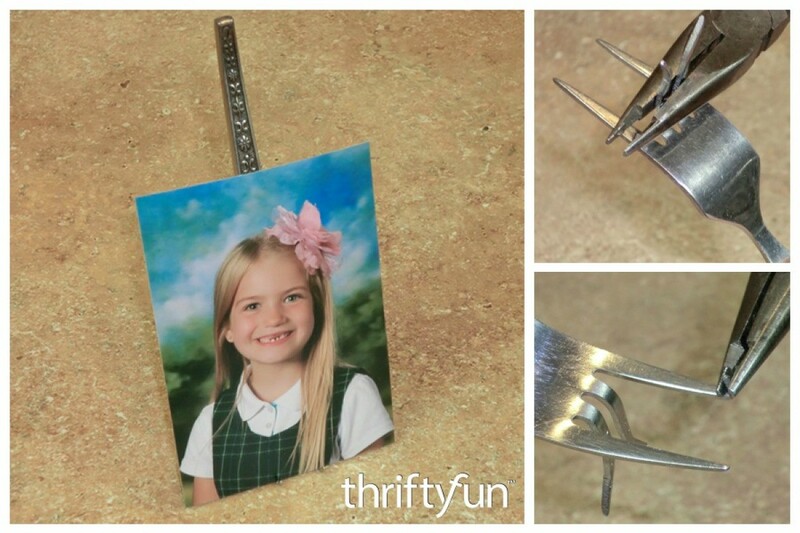 Pick up a decorative fork at the thriftstore or a yard sale and create this photo holder. It is simple and fun. This is a guide about recycled fork photo holder. 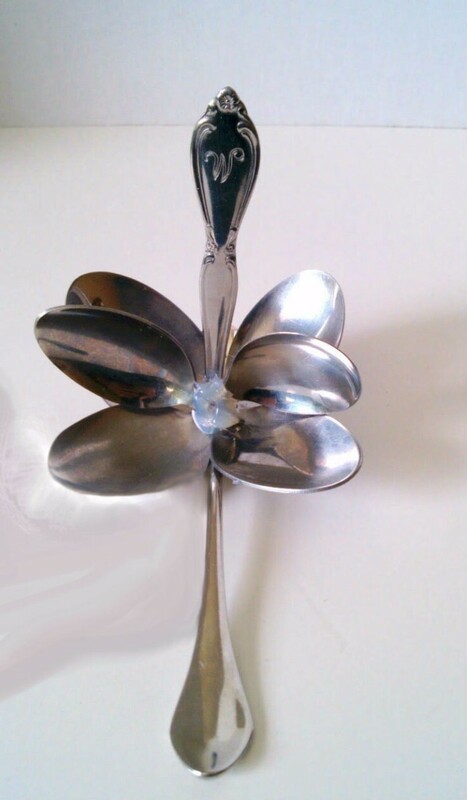 This decorative flower is made from used flatware spoons. This is a guide about how to make a recycled spoon flower. How do I bend silverware for drawer pulls and/or how do I find answers for last November's post on this subject? I was wondering if anyone knew how to bend silverware to use as cabinet knobs and drawer pulls? I have both forks and spoons I want to use for this. Editor's Note: Here is the link to that kitchen makeover with the silverware drawer pulls.